Welcome To Mongolia's New Postal System: An Atlas Of Random Words Turns out it's often tough to track down an address in Mongolia. So, the country asked a British startup to help overhaul its address system, using random three-word phrases to make it more exact. 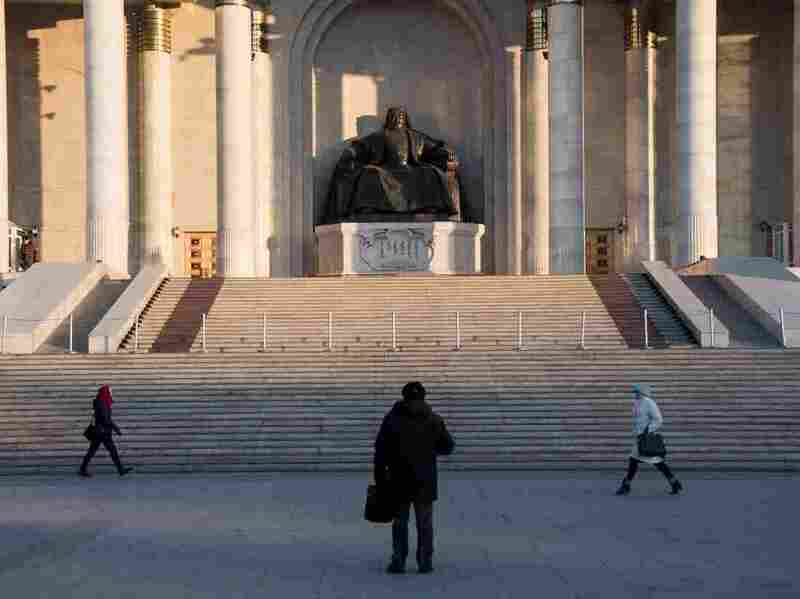 Care to visit the statue of Genghis Khan in front of Ulaanbaatar's Parliament House? Better direct your steps to Undulations.Cheer.Androids. It is tough to be a postman in Mongolia. The country is among the world's most sparsely populated — twice the size of Texas with about one-tenth the state's population of about 27 million. Its roads, even in the capital city of Ulaanbaatar, often lack well-known names, making navigation difficult and street addresses unreliable. To make matters even more complicated, about a quarter of the country's residents are nomadic, with no permanent homes. All of that means it can often be incredibly challenging for the Mongol Post to locate people. Things are looking up, though. The Mongolian government has partnered with a British startup called What3Words to overhaul its postal and address systems. Now, instead of an address — like, say, 1600 Pennsylvania Ave. — each 9-square-meter plot in Mongolia will receive its own three-word identifier. "What we've done is we've cut the world into 3-meter squares, so that's 57 trillion 3-meter squares," Chris Sheldrick, co-founder of What3Words, tells NPR's Rachel Martin. "And there's enough words in the dictionary — so, I'm talking words like table, chair, spoon — that you can actually assign three words to every 3-meter square in the world and you don't run out of combinations." Today in Mongolia, detailed directions and landmarks are often used in lieu of traditional street addresses; there aren't many other options. "Even in the capital city, Ulaanbaatar, there aren't really street names that people use in everyday life," Sheldrick says. "You can't put [an address] into an app, and people tend to use directions — or they say, you know, 'by the blue, tall building,' or 'the lampost on the left.' "
When the new system is put into place though, things will be a bit different. "The first thing that somebody would do would be to discover their three words," he explains, by downloading the app. Once equipped with their own address phrase, Mongolians will be able to provide a precise and unambiguous location for any number of uses — like navigation, banking and online shopping. And while he is happy about the partnership with the Mongol Post, Sheldrick thinks the What3Words system can be a global tool. Even in comparatively well-addressed countries like the U.S. and Canada, Sheldrick says that there are plenty of places that go without an exact address. "Just because your house is OK, perhaps the people around the other side of the street struggle to get found," he says. Mongolia will be switching over to the system for government mail delivery next month. But don't count on the U.S. making the change anytime soon. Just in case, though, better mark this down: If you care to write us here at NPR, just try us at Dream.Caves.Miss. Statue of Liberty --> Planet.Inches.Most. Great Pyramid at Giza --> Dreaming.Munch.Magnetic. 221B Baker Street, home of Sherlock Holmes --> Junior.Holds.Keep. Golden Gate Bridge --> Super.Skirt.Letter. North Pole --> [Not found].